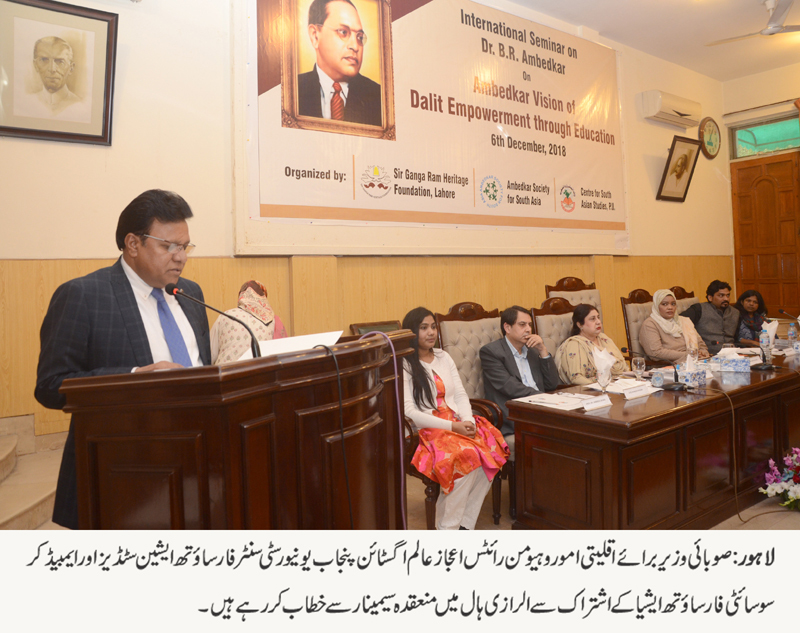 LAHORE: (Thursday, December 6, 2018): Speakers at a seminar on renowned Indian Bhimrao Ramji Ambedkar’s vision of empowerment through education has stressed the need to empower oppressed people through education. The seminar was organized by Punjab University Centre for South Asian Studies (CSAS) and Ambedkar Society for South Asia (ASSA) at Al Raazi Hall here on Thursday. Punjab Human Rights and Minorities Affairs Minister Mr Ijaz Alam Augustine, PU CSAS Director Prof Dr Umbreen Javed, ASSA Director Shaheen Hasan, scholars and activists from India including Manjula Pradeep, Dr Kaushal Panwar, Dr Parmod Kumar, Ms Manisha Mashaal, Mr Satyndra Kumar, Archana VAidya, faculty members and a large number of students were present on the occasion. 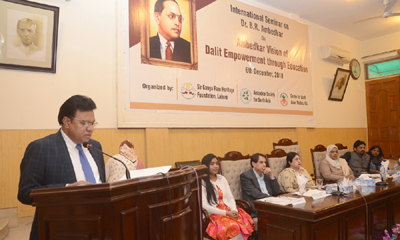 Addressing the seminar, Mr Ijaz Alam Augustine emphasized on the idea of Ambedkar’s vision of educational empowerment. The Indian speakers shared their personal experiences of facing discrimination as Dalit community members in educational institutions and overall society in India. They paid tribute to Ambedkar for making this scheduled caste able to get education and recognition in deeply stratified Indian society. They said that around 1 billion people of both the countries were facing various challenges like poverty, lack of education and health facilities etc and most of them were living in miserable conditions. They said that both the governments must avoid conflict, enhance bilateral relations and focus on reducing the problems being faced by their people. Prof. Dr. Umbreen Javiad said that equal rights and opportunities must be provided to every citizen of the country so that the feelings of deprivation could be removed. She said that the centre had been holding this international seminar every year and it had become a regular feature. Syed Shaheen Hassan greeted all the guest speakers from India and the participants. He also appreciated Prof. Dr. Umbreen Javaid for her efforts and continuous and encouraging support to organize seminars on such an important topic regularly. Later, souvenirs were presented to the speakers.